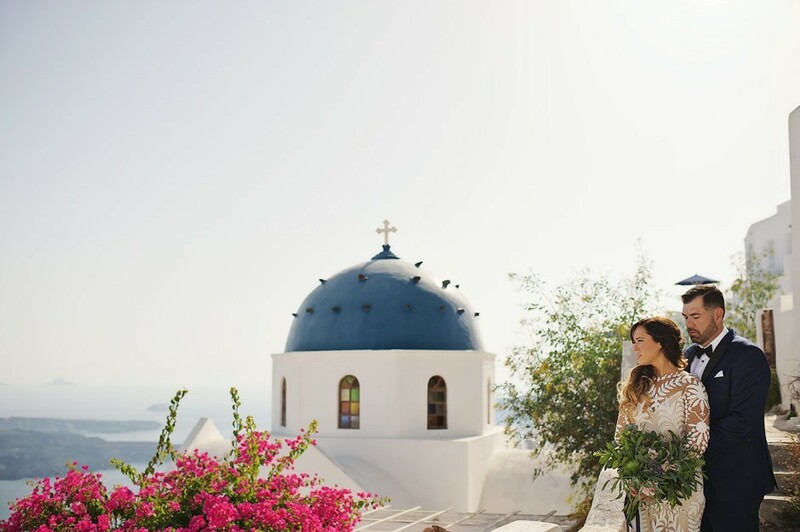 If there is one thing I absolutely adore as a destination wedding photographer, it is shooting elopements. 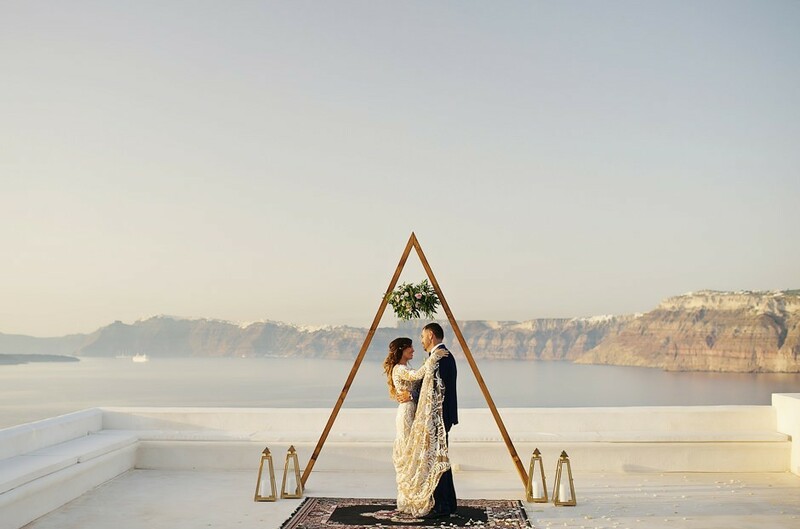 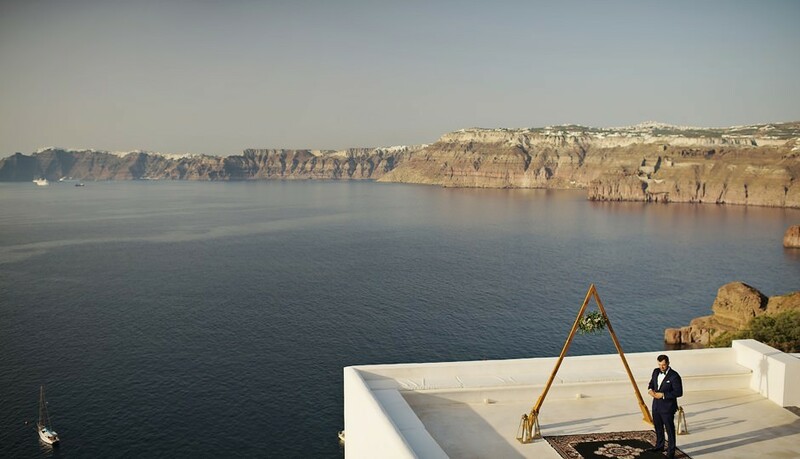 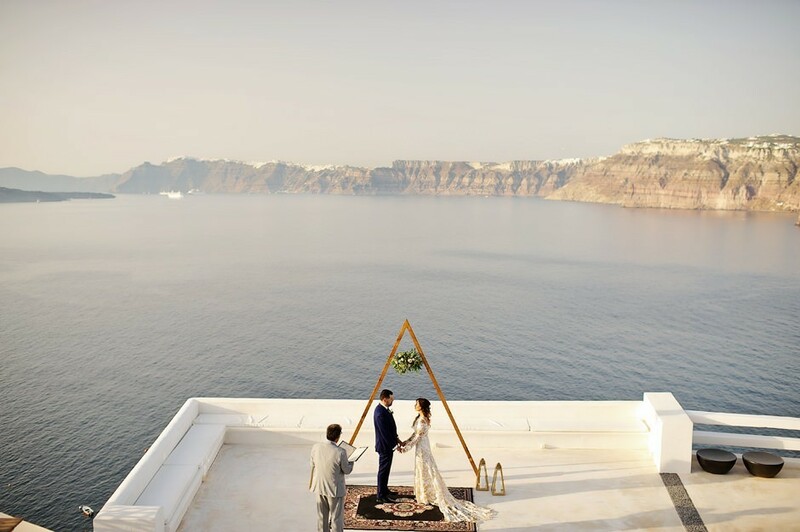 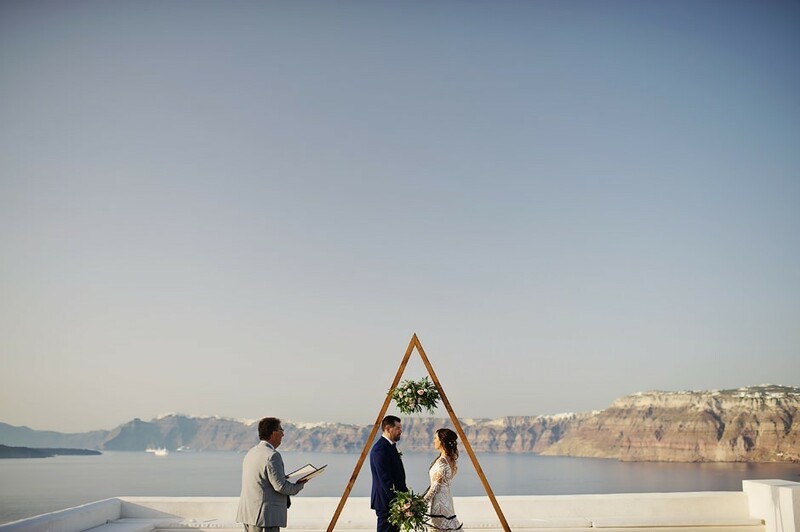 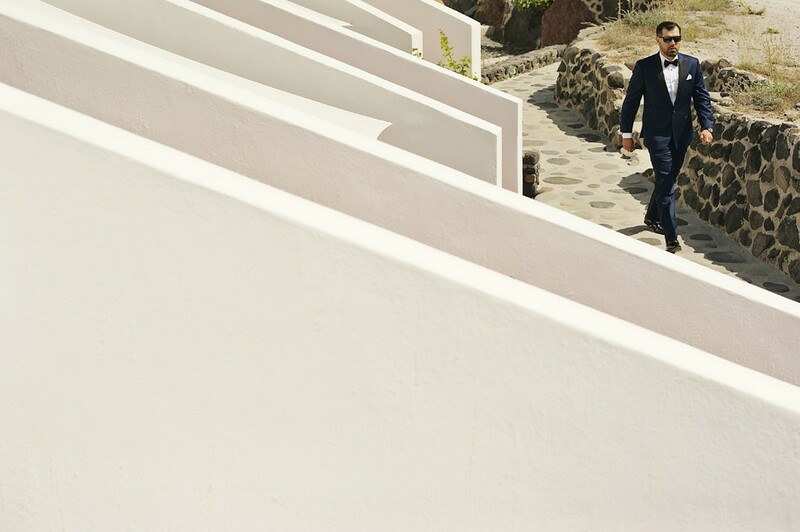 And if there is a magical place that provides the perfect setting for a romantic elopement, it is definitely Santorini, one of the most stunningly beautiful Greek islands. 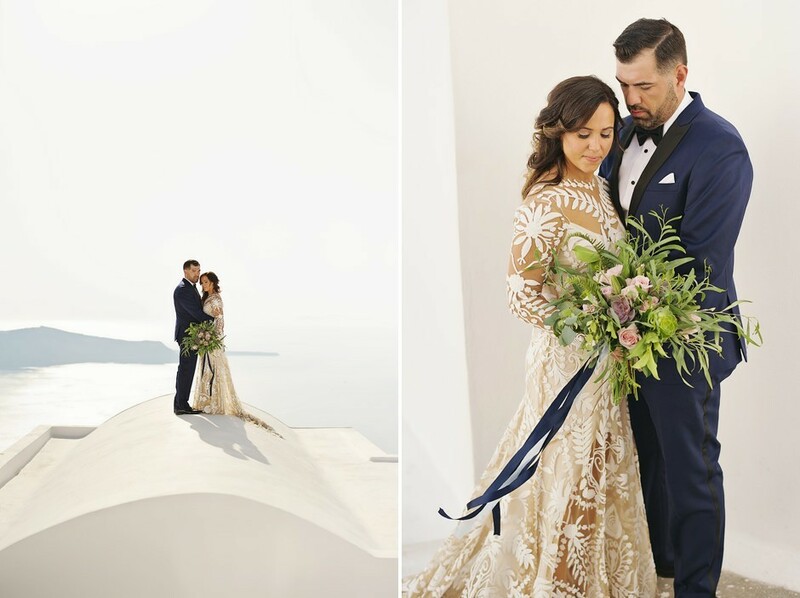 Add to that one of the loveliest and kindest couples I have ever met in my professional career, and you have the recipe for the most amazing wedding photos. 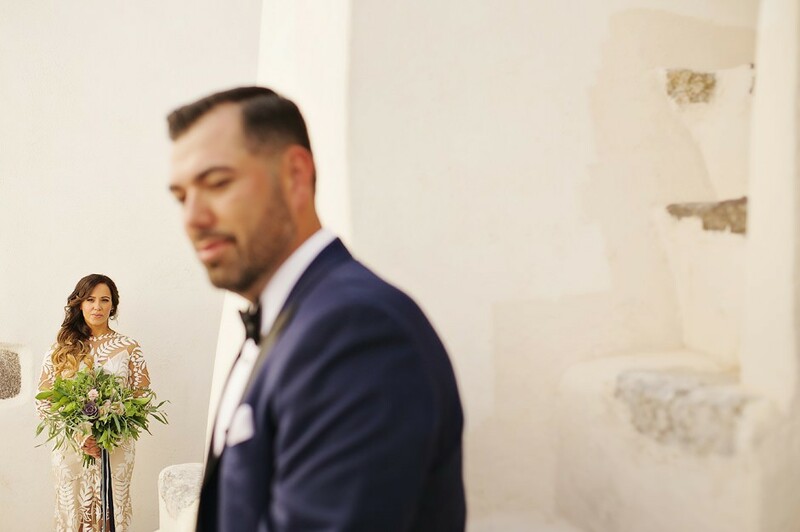 It’s hard to put into words what I feel for Melissa and Juan. 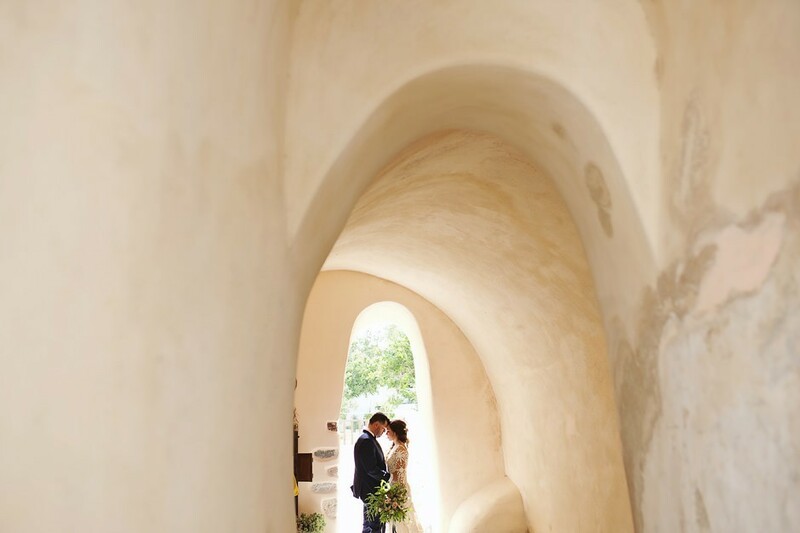 From the very first time we communicated through Skype, I just knew that everything would turn out perfect. 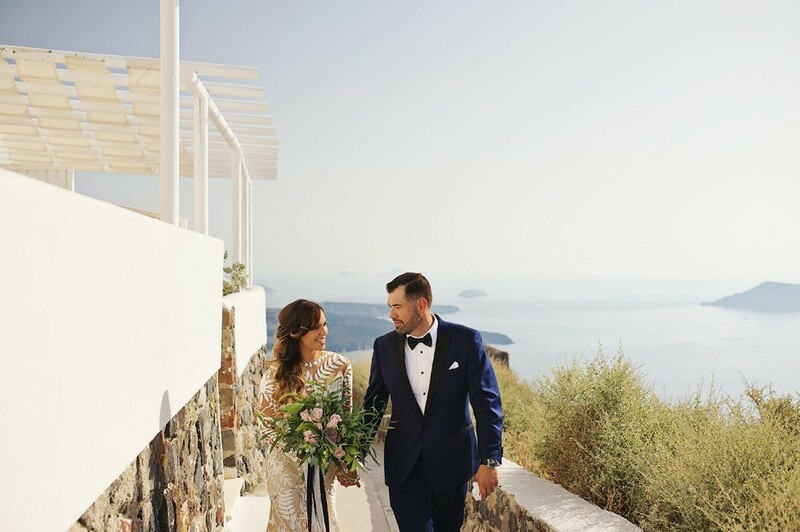 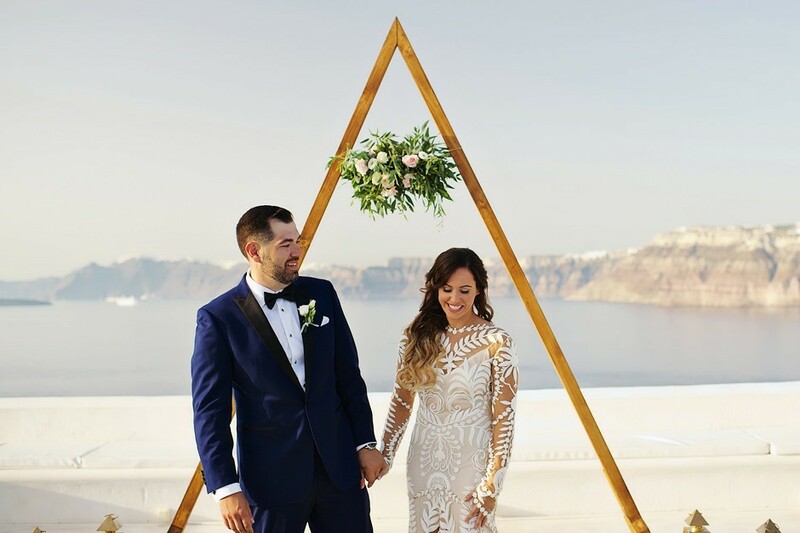 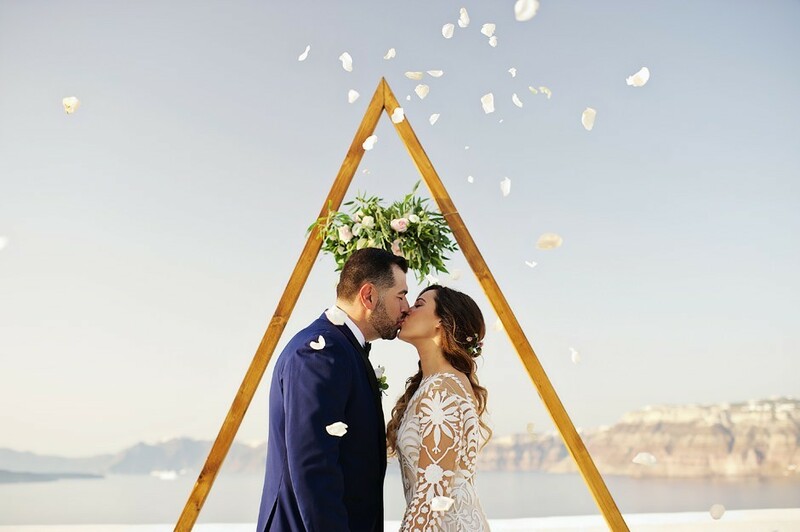 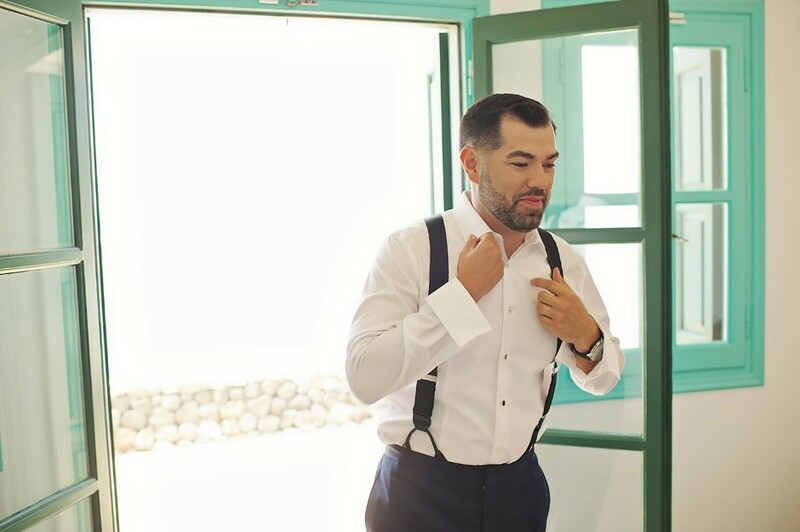 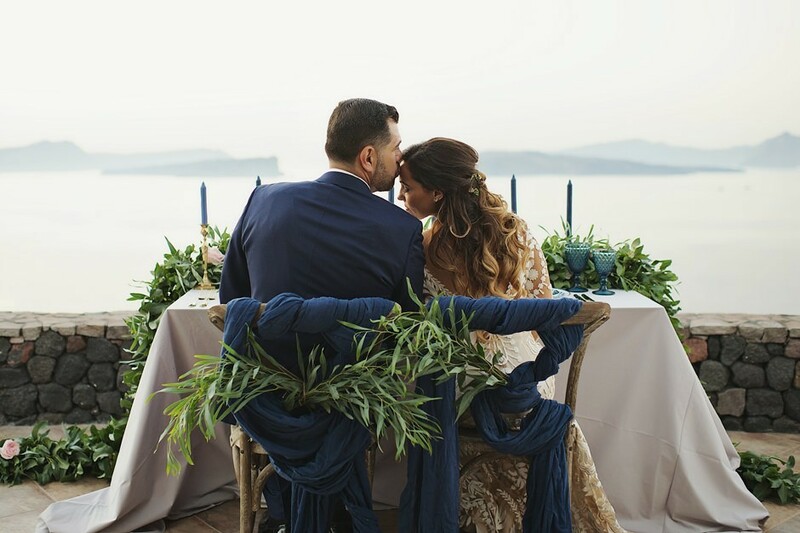 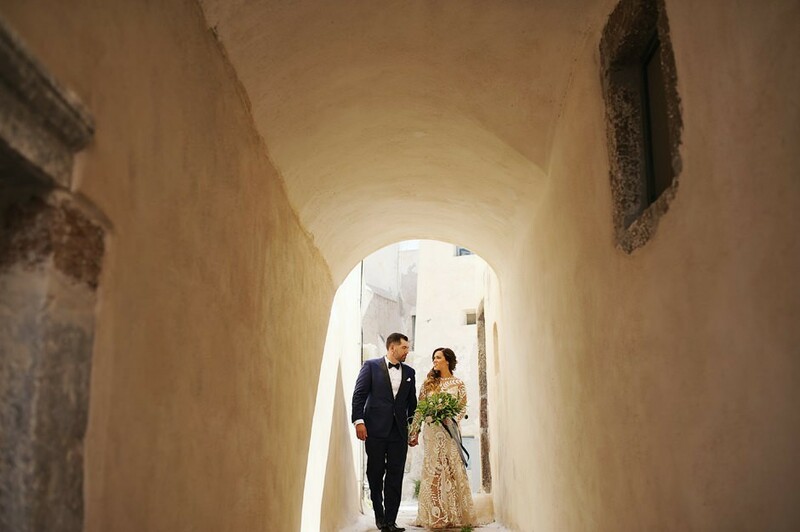 They traveled from Chicago to elope in Santorini on one of the hottest days of Greek summer, but this did not deter them in the least – they were both so excited and happy about that special day and had such a positive attitude to everything that nothing could go wrong! 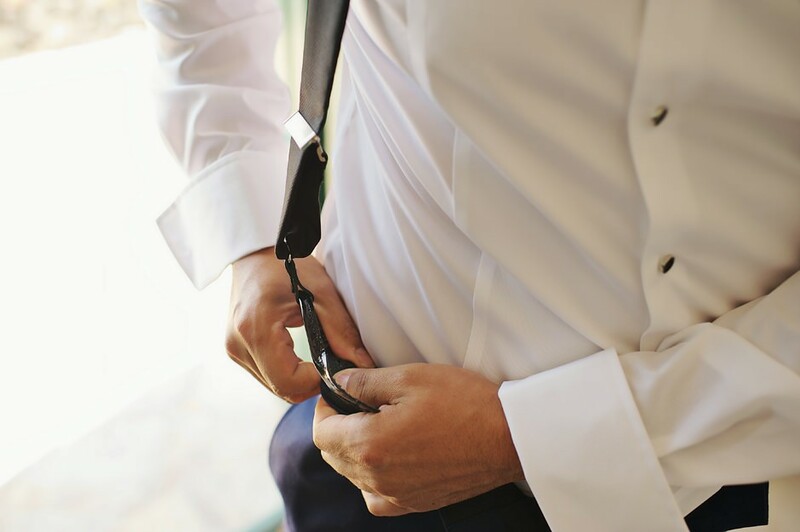 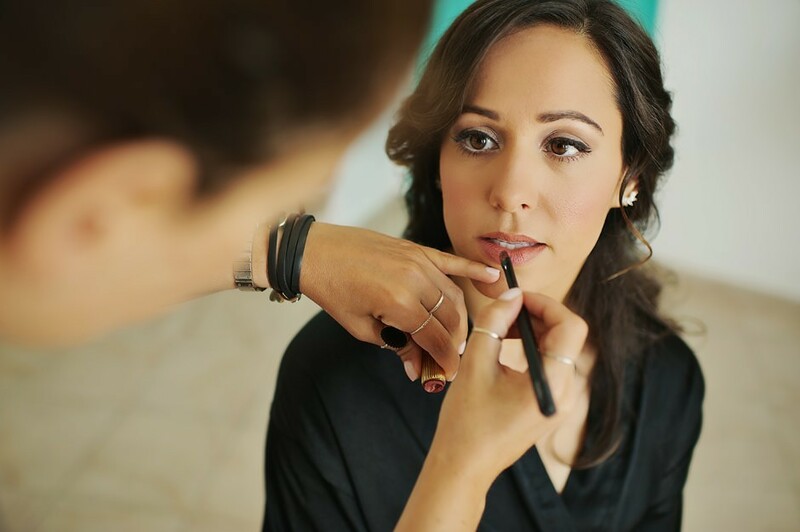 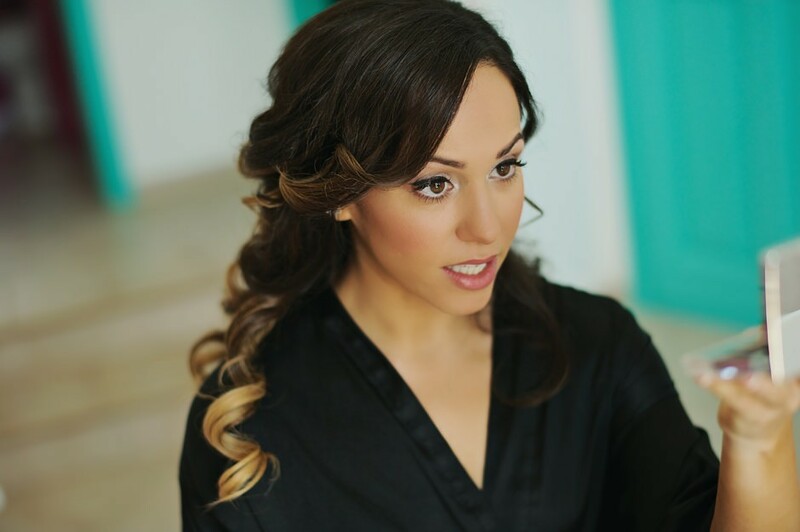 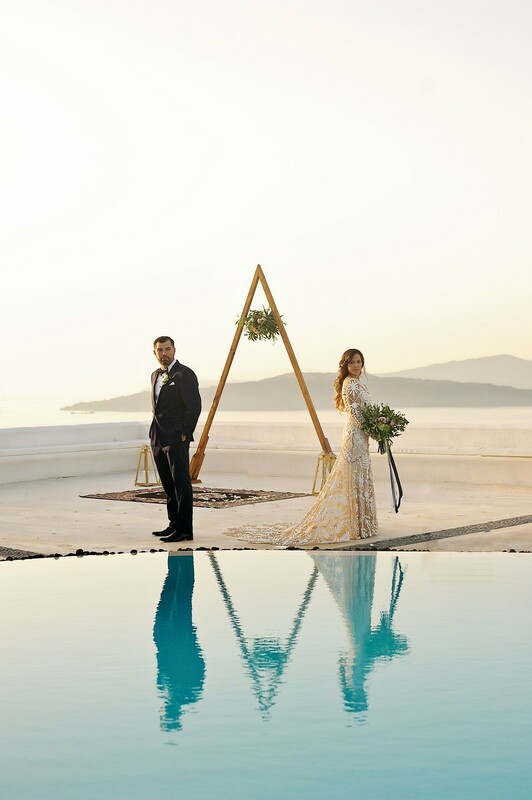 The bride and groom preparations took place in Avant Garde, a wonderful hotel combining modern design, warm hospitality, and breathtaking views. 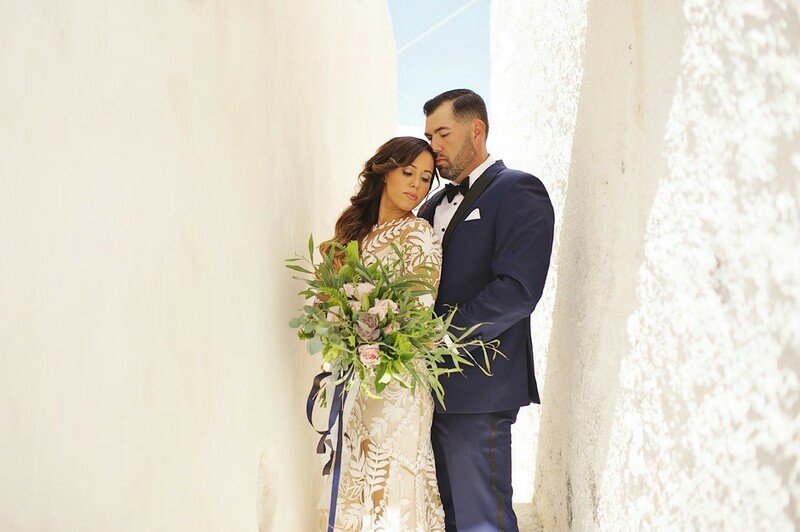 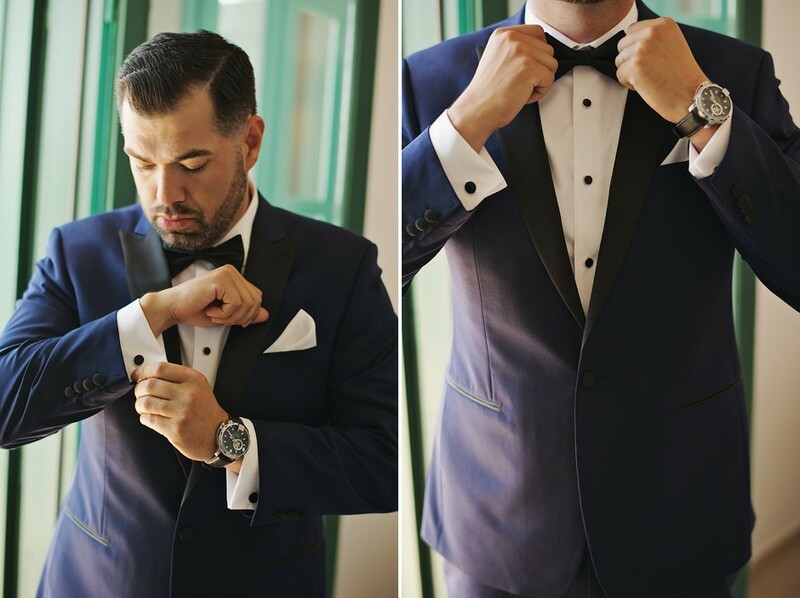 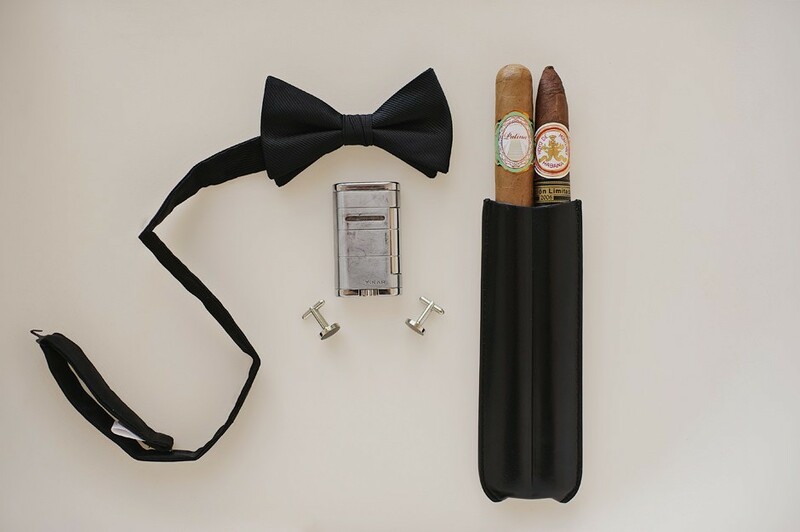 Melissa had chosen a fabulous handmade Rue de Seine wedding dress with exquisite Cornelli lace, low back, full skirt and a train, and Juan wore an awesome blue tuxedo with suspenders and a bow tie. 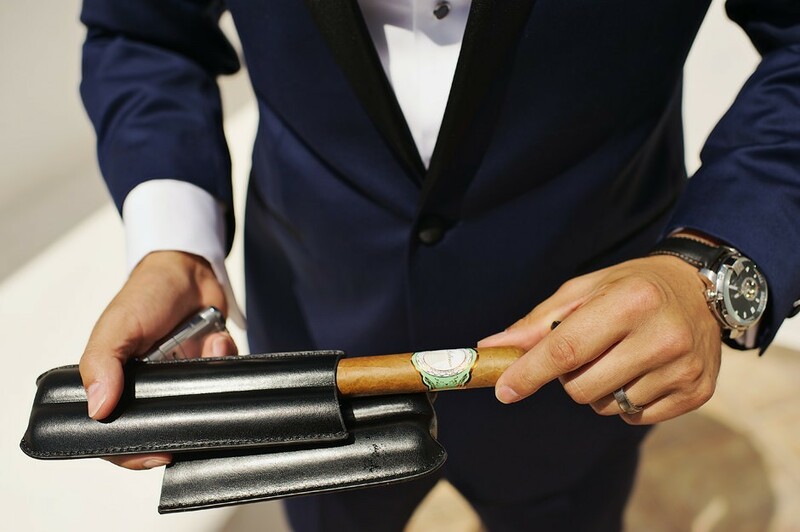 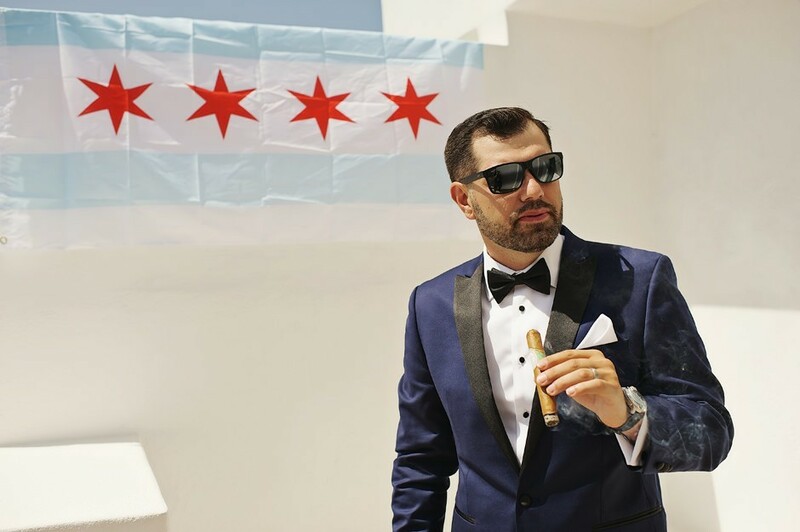 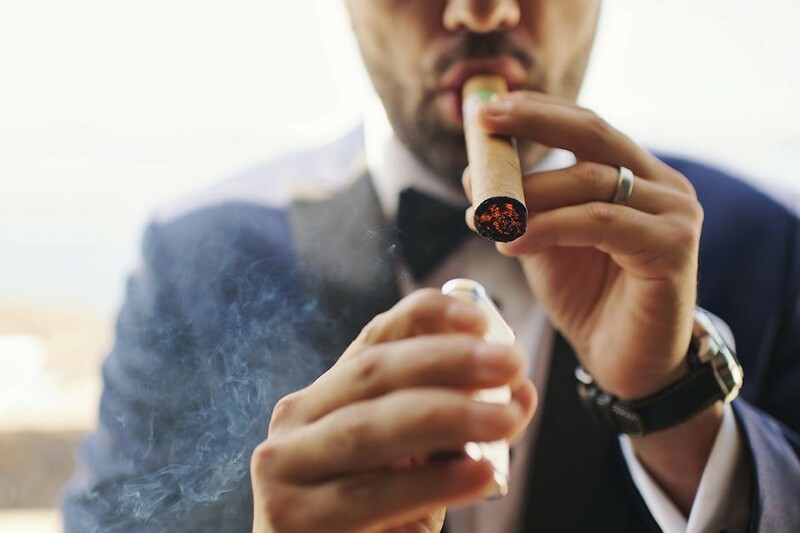 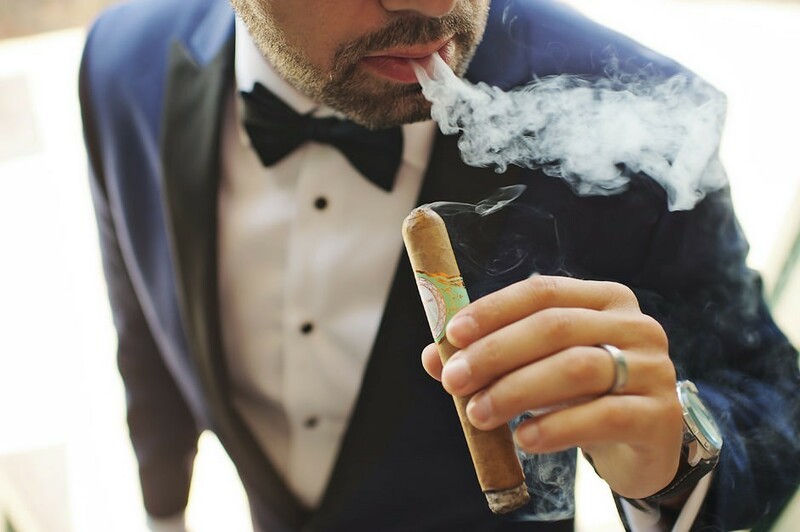 The groom, a proud Chicagoan, posed in front of the flag of the Windy City and had the chance to enjoy his favorite cigars. 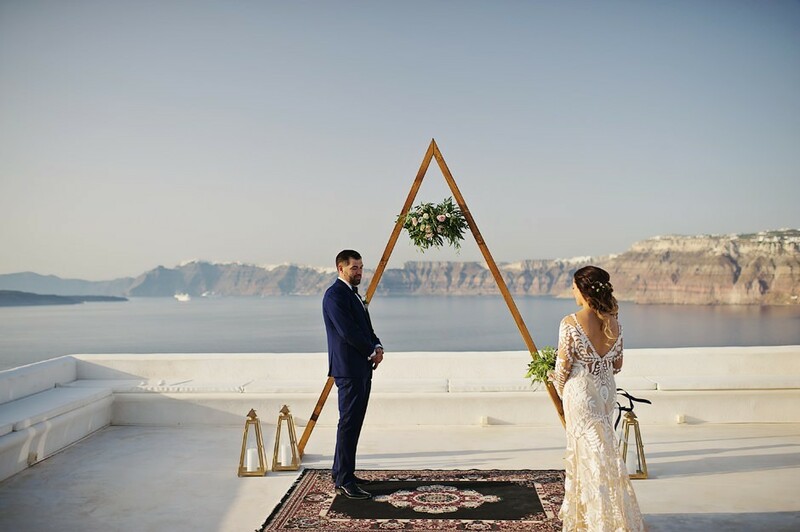 When I first saw the terrace looking out onto the caldera and the sparkling Aegean blue where the ceremony would take place, I was impressed by the elegant and very original wooden arch created by Maria, from Tie the Knot, who was once again a delight to work with. 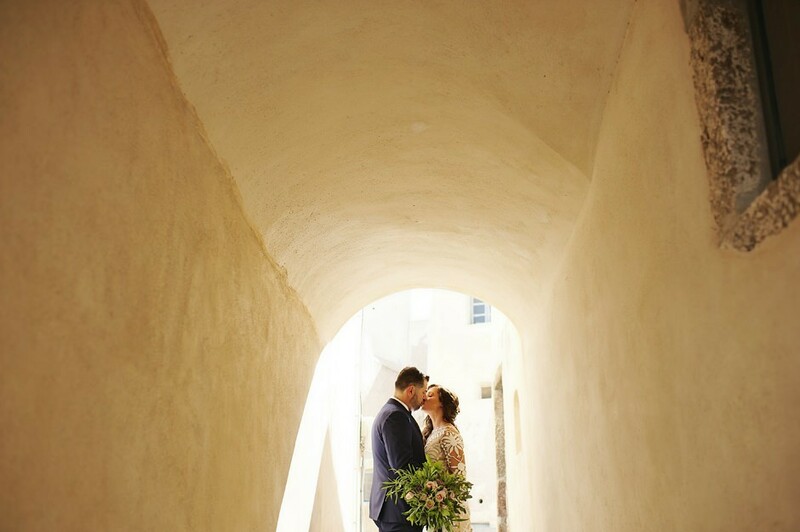 As Melissa and Juan were standing before the triangular arch, you had the feeling that it was hugging them! 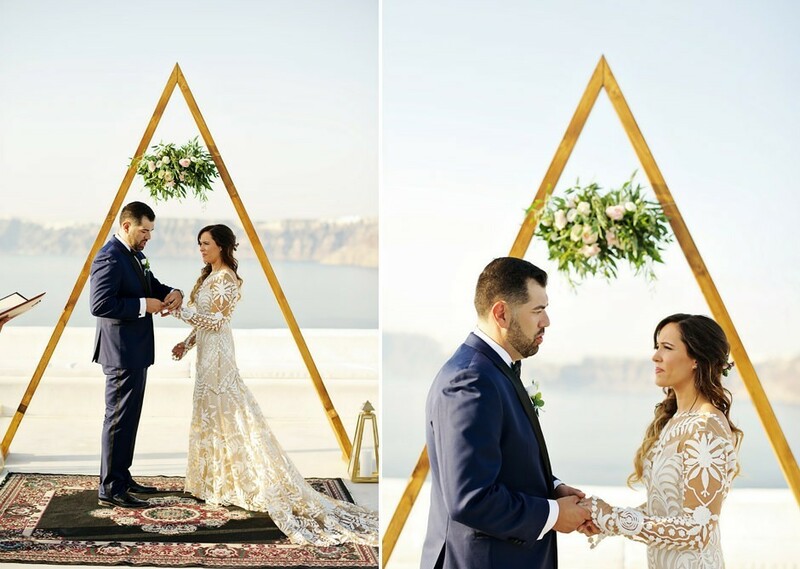 The flowers on the arch, a carpet with earthy colors and candle lanterns on the floor ideally completed the simple but beautiful wedding decoration. 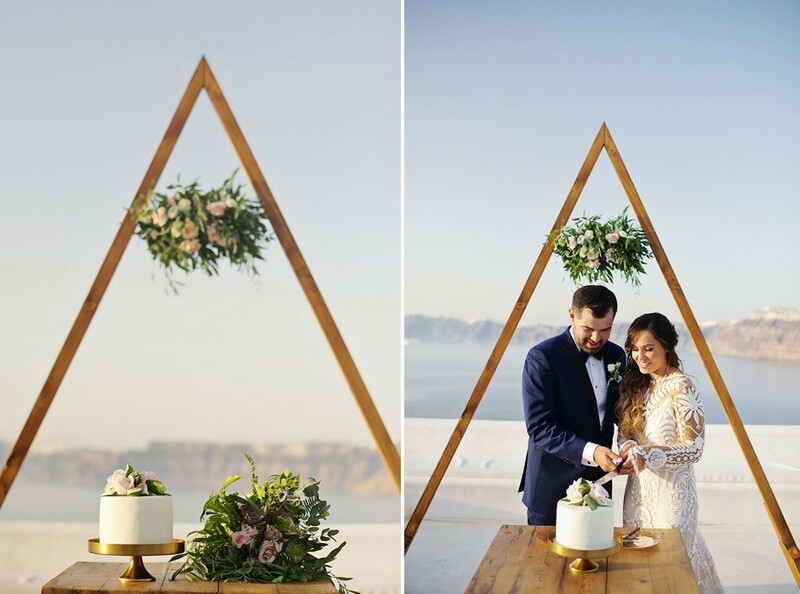 After exchanging their vows and before their first dance, the newlyweds cut the wedding cake and enjoyed a glass of champagne. 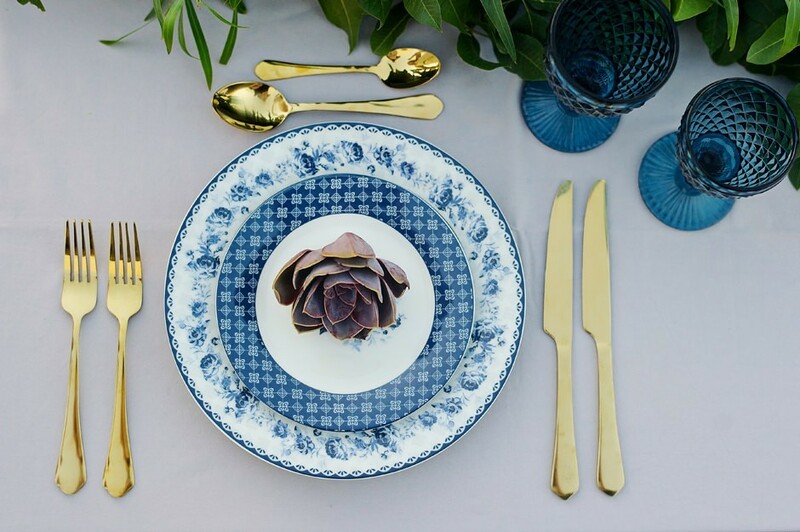 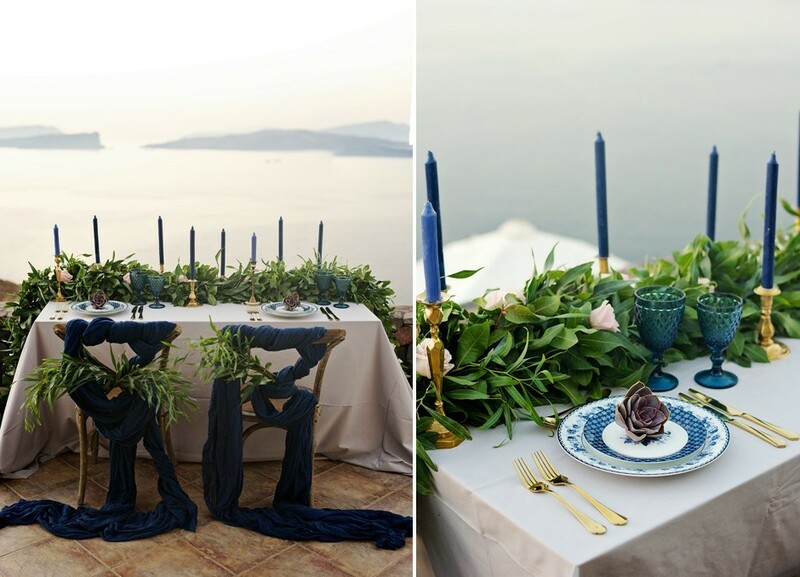 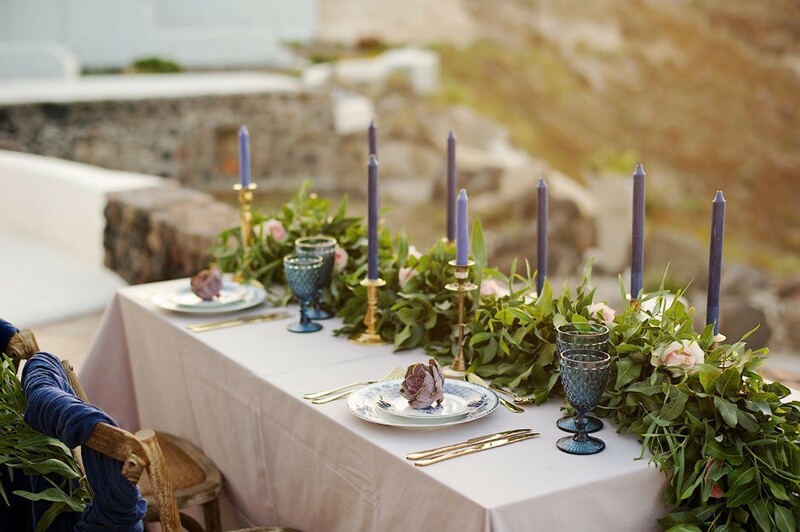 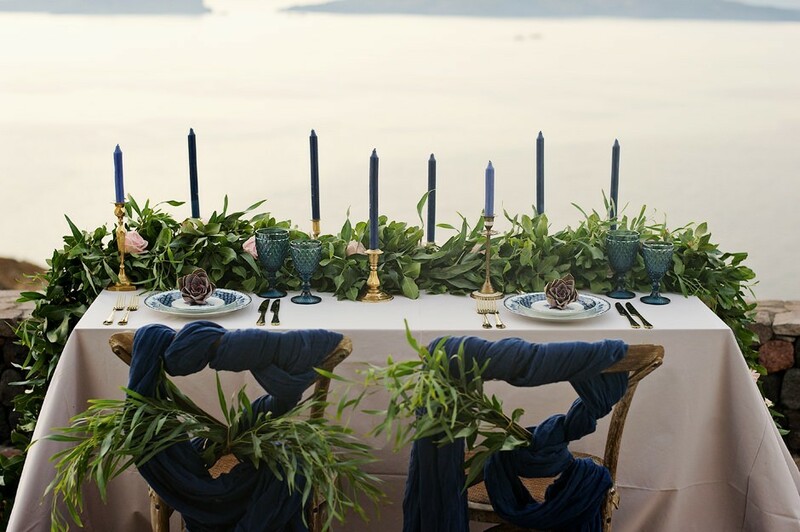 Dark blue dominated the table set exclusively for them, with gold cutlery and candlesticks, a wonderful flower arrangement and a cute little cactus placed on each porcelain plate. 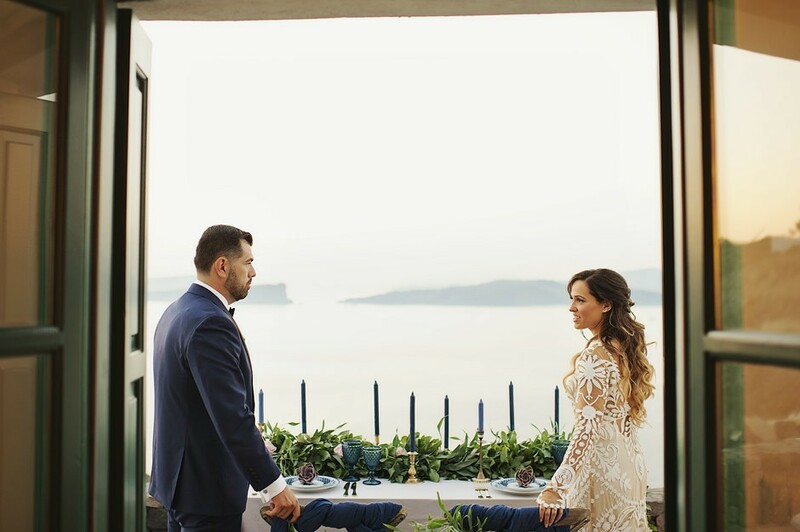 It is always so touching to watch two sweet people genuinely in love celebrate every moment of their dream-come-true elopement! 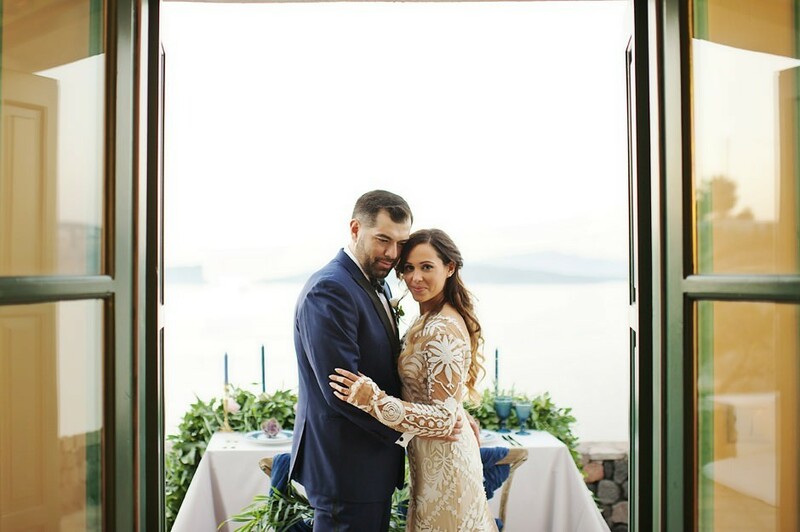 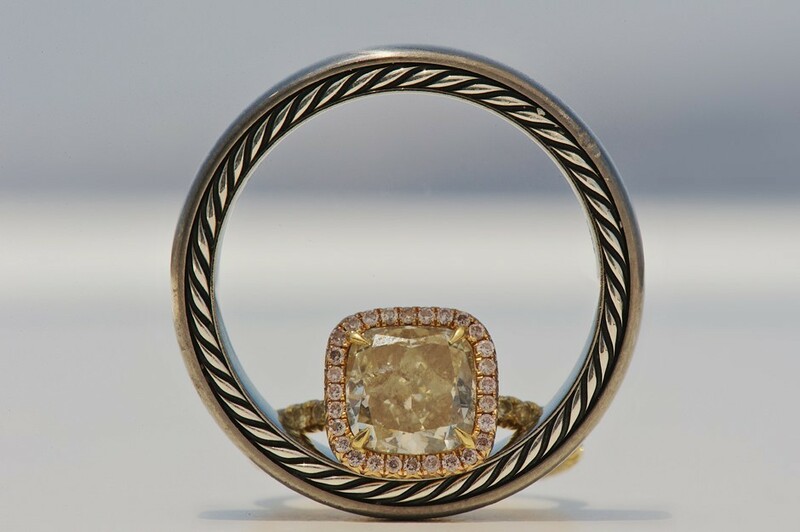 Dear Melissa & Juan, thank you from the bottom of my heart for your trust! 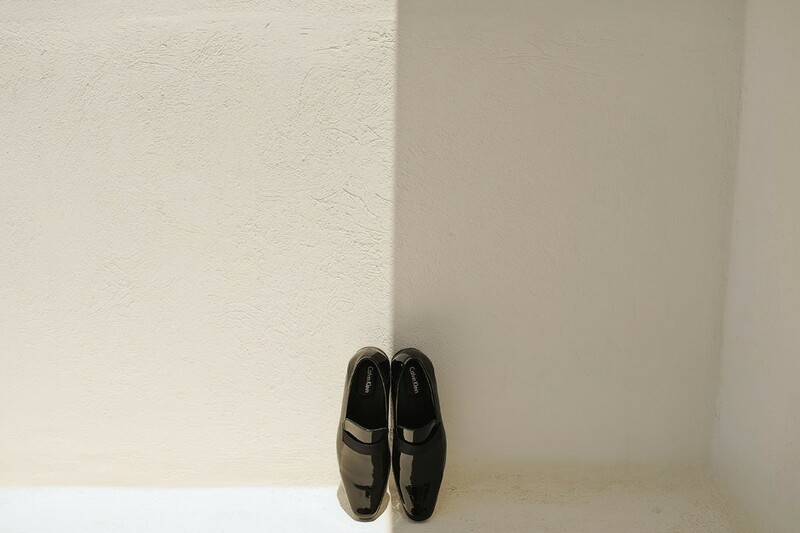 I wish you all the happiness in the world and hope we meet again someday!